“The level of preparedness is better than it’s ever been before,” says Scott Cowen, former president of New Orleans-based Tulane University. Harvey, as a tropical storm, made its second landfall early Wednesday morning in western Louisiana. As a hurricane, Harvey hit southeast Texas late Friday and in the ensuing days dumped record rainfall and brought devastating flooding to the Houston area. The Federal Emergency Management Agency — roundly criticized for its response to Hurricane Katrina in 2005 — has been “much more effective” in dealing with the tragedy unfolding from Hurricane Harvey in the Houston area, said Scott Cowen, the former president of Tulane University who had helped lead rebuilding efforts in New Orleans. “The level of preparedness is better than it’s ever been before,” he told CNBC’s “Squawk Box” on Wednesday. Cowen should know, because Katrina in 2005 flooded 70 percent of Tulane, which forced the university to close for a whole semester. The school suffered more than $650 million in damages. On Tuesday, Tulane’s New Orleans campuses were closed as a precaution as Harvey was tracking toward Louisiana where it eventually made a second landfall in the early morning hours Wednesday as a tropical storm in the western part of the state. As a hurricane, Harvey hit southeast Texas late Friday and in the ensuing days dumped record rainfall and brought devastating flooding to the Houston area. Weakened levees there were in danger of failingand rivers have yet to crest. 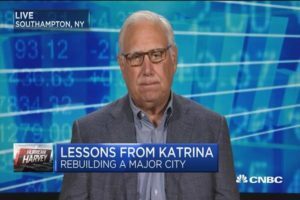 “When I look at what’s happening in Houston today versus 12 years ago with Katrina, first of all FEMA is much more effective,” said Cowen, who in 2005 partnered with a coalition of civic, business and nonprofit leaders to resurrect New Orleans and rethink the city’s antiquated systems. Ironically, Cowen described in his book, “The Inevitable City: The Resurgence of New Orleans and the Future of Urban America,” how he and Tulane officials worked to reopen the university from the safety of Houston after Katrina swept through New Orleans on Aug. 29, 2005. He said he spent the entire month of September that year in Houston, except for three days in Dallas, after being evacuated for Hurricane Rita, which made landfall on Sept. 24, 2005, along the Texas-Louisiana border. Rita ended up sparing Houston but hit southwest Louisiana and the Beaumont–Port Arthur area in southeast Texas. “It’s a different situation in terms of magnitude … the size of Houston versus New Orleans,” said Cowen. Houston is the fourth-largest city in the nation with a population of about 2.35 million people. New Orleans, pre-Katrina, had a population of about 455,000. Cowen said the focus in Houston right now should be on rescuing stranded residents and helping shelter people left homeless by the floods. The federal government — and those in states and cities — which learned from Katrina will also learn from Harvey, he said. The failures of FEMA in 2005 became apparent as then-President George W. Bush, while touring Katrina destruction, infamously praised then-FEMA Administrator Michael Brown. “Brownie, you’re doing a heck of a job,” Bush had said at the time. Brown resigned shortly thereafter over what was viewed as a mishandling of the federal response to Katrina. Brown, who spoke to CNBC on Tuesday, also praised FEMA — describing its current administrator, Brock Long, as a “great person to have in this position.” Long, nominated to head FEMA in April by President Donald Trump, was confirmed in June. Trump on Tuesday visited Texas where Long has been leading the administration’s response to Harvey.